At Lavastar we manage the on-site marketing for some of the UK’s leading property developers and home builders in the form of Site Hoardings, Building Wraps and other bespoke Construction Signage. When the project is complete and it is time to start selling, one of the most popular methods of advertisement which then take their place are Property Sales and Marketing Flags. These flags, also known as House Builder Flags or simply Property Development Flags, are exceedingly popular due to their high visibility and sleek, professional finish. If you are interested in enquiring about our premium Property Sales Flags then please don’t hesitate to contact us today on 01252 850 818. One of our team will happily talk you through the various options available to you and tailor a package to fit your specific budget and needs. 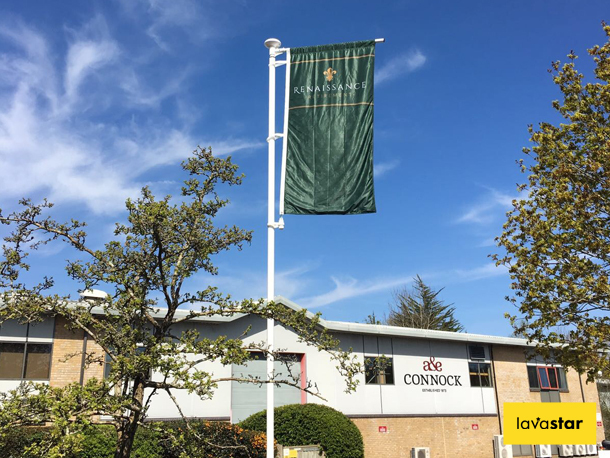 We have set the industry standard for premium Property Sales Flags thanks to our robust, easy-to-assemble flag poles and our ultra high quality printed flags. All of our Marketing Flags come with a lightweight, two-part aluminium flag pole for ease of transport and assembly. The flag poles are finished in a timeless white powder coating as standard, although we offer a RAL colour matching service if so desired. We supply all House Builder Flags complete with rotating arm and ground sleeve and can provide professional installation teams to erect the flag poles if necessary. Our Property Development Flags are designed for portrait style flags so that your brand can be on show at all times, no matter the weather conditions. However, we can also produce flags and flag poles to fit any specification or style, simply email us your requirements and we will get back to you as soon as possible with a full list of available options. All of our Property Sales and Marketing Flags are produced on a bespoke, flag to flag basis. This means that we can make them to virtually any size or finish, printing in a full array of bold and vibrant colours with fantastic see-through properties. When it comes to fabrics, printing methods and inks, we have done all the painstaking research so that you don’t have to. Just rest assured that a flag produced by Lavastar is a flag which is going to sit a cut above the rest.